With quotations by Doubleday first followed by others in alphabetical order of the person making the quote. The first note is the location where I found the quote and the second is the footnote in that work which contains more background information on the quote. Doubleday speaking about his interests as a youth. Doubleday discussing his feelings about disobedience of a senior officer’s unlawful order to arrest a civilian. Doubleday to Maj Harry T. Lee of his staff on July 3 at Gettysburg. As he is about to eat a sandwich, it is showered with dirt from a Confederate artillery round which exploded nearby. Originally From Doubleday to John Newton, July 5, 1863. Abner Doubleday Papers, New York Historical Society. Originally From The Gettysburg Campaign: A Study in Command by Edwin Coddington. New York: Scribner’s, 1968. 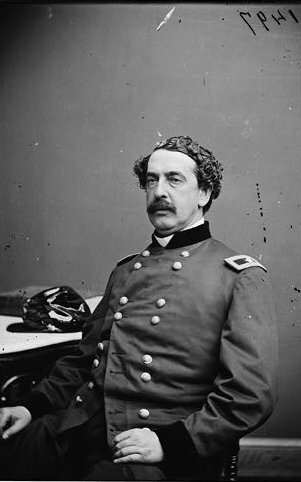 Division Commander John Hatch decribing Doubleday’s actions at Second Bull Run in his official report. Originally From H.S. Huidekoper in New York Monuments Commission for the Battlefields of Gettysburg, Chattanooga, an Antietam: In Memoriam Abner Doubleday, 1819-1893, and John Cleveland Robinson, 1817-1897. Albany, NY: 1918. “Doubleday, to whom that command fell by seniority, was brave and capable enough for ordinary emergencies; but this emergency was extraordinary, and the soldier to whom he succeeded was without peer in the army….Stll, it is no disparagement on the other that the same cannot be said of him.” George Meade Jr. Originally From Meredith L. Jones Commemorative address in New York Monuments Commission for the Battlefields of Gettysburg, Chattanooga, an Antietam: In Memoriam Abner Doubleday, 1819-1893, and John Cleveland Robinson, 1817-1897. Albany, NY: 1918.